As Tax Day winds to a close and I came back from schlepping my check to the post office, I vowed that next year I'm going to be so organized that my taxes will be totally finished by the end of January and I won't owe a thing, because I will have calculated my obligation down to the penny in advance. It's a goal that I fail to meet every year, but next year could be different. In the meantime, I'm studying up on places that will give me free advice that will reduce my anxiety about my taxes -- even if it doesn't do anything to free me from the obligation to pay the stinking things. TaxMama.com. 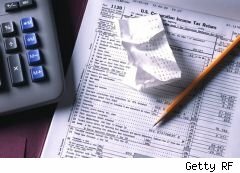 Don't file now, file later, says TaxMama Eva Rosenberg. As she points out, extensions are free and easy. USPS.com. If you've forgotten where the post office is, try this USPS locator. And remember, many stay open to midnight on tax day. Don't Mess With Taxes blogger Kay Bell offers valuable (and free) last-minute advice on Bankrate.com for anyone rushing to mail the check late. Make sure you send it first class, she says, because that first-class postage persuades the IRS you had the best of intentions and really did mail it on time. Volunteer Income Tax Assistance. If you're staring at the form and totally flummoxed, it's not too late to get free help from VITA, the government-run tax assistance service. Here are the VITA locations; some of them are open late. Good luck. And remember, Starbucks is still pouring out free coffee today, if you bring your own cup.